Even as the winds of war were blowing, Cadillac was preparing to phase out the 1938-1941 Sixty-Special Cadillac, at least as Mitchell had originally conceived it. To be sure, the 1942 Cadillac lineup had a model bearing that designation, but it was of another breed. 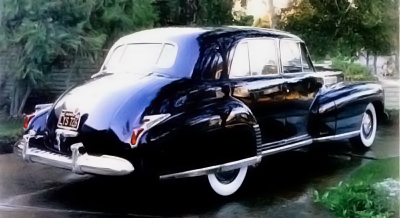 Replacing the distinctively styled 1938-1941 design with its unique bodyshell was simply a stretched, though beautifully finished, version of the Series 62 four-door, utilizing the massive new C-body that Cadillac shared with Buick and Oldsmobile. There was nothing wrong with that, of course. The Sixty-Special of that abbreviated model year was as impressive as ever, as indeed it would be in the postwar era. But it was no longer quite so "special," a difference that has not been lost on today's collectors. While a fully restored 1941 now brings around $23,000 -- perhaps $1,000 more if it happens to have a sunroof -- the 1942 is worth no more than $10,000 in comparable condition and the postwar continuations go for even less. Certain elements of the Sixty-Special Cadillac were toned down during the fifties and sixties. The Sixty-Special became even less special in the Fifties and Sixties. Usually it was just a Series 62 or DeVille four-door with more ornate exterior trim and interior furnishings, though it did retain the exclusive 133-inch wheelbase adopted for 1942 all the way through 1958. Even the name was progressively watered down, and it disappeared completely in favor of the Fleetwood Brougham label with the advent of Cadillac's first downsized big cars for 1977. But the original Sixty-Special Cadillac and its sporting, slightly raffish character would never be forgotten on Clark Avenue. As Mitchell himself suggests, its spiritual descendant is today's Seville, the enormously successful compact Cadillac, introduced in 1975. So the Sixty-Special and its great heritage lives on, in current Cadillacs and in the many 1938-1941 originals lovingly preserved by their proud owners. The undeniable influence of its design -- and the inspired hand of its designer -- can be seen in most of the better-looking automobiles produced over the last 40-odd years, and that's as it should be. As the last sentence of Cadillac's oft-quoted 1914 "Penalty of Leadership" ad reminds us: "That which deserves to live -- lives." In the next and final section of this article, get specifications for the 1938-1941 Sixty-Special Cadillac.